Clean and wash your face thoroughly. Pat it dry. Now, pour 3 to 4 drops of 100% pure undiluted tea tree oil onto a small cotton ball and dab it on your acne. Leave overnight so that the oil can go deep into the skin, unclog the sebaceous glands, cleanse the skin pores and finally dry the acne up. It will decrease the swelling as well as the redness of the trouble spot significantly. Women with sensitive skin should avoid using pure undiluted tea tree oil. Rather, prepare a tea tree oil solution by mixing 5 drops of the oil with 5 drops of lukewarm water and go ahead. Take 3 teaspoons of fresh aloe vera gel and add 4 to 5 drops of pure tea tree oil to it. Mix well. Then, apply this mixture to the acne. In this home spot treatment, the soothing and nourishing aloe helps us make the most of the antimicrobial properties of the tea tree oil. Replace the aloe vera gel with 4 teaspoons of raw organic honey. Adding 4 to 5 teaspoons of pure tea tree oil to it will form a great acne-healing mixture due to the anti-bacterial properties of honey. Keep the mixture on the affected areas of the skin for 20 minutes. Then, wash off with plain water. Take 3 tablespoons of organic yogurt and pour 5 drops of tea tree oil to it. Blend well. Apply the mask all over your face and wait for 15 to 20 minutes. After that, rinse with fresh cold water. Apart from treating acne, this mask also helps in making our skin radiant. Mash a medium-sized tomato. 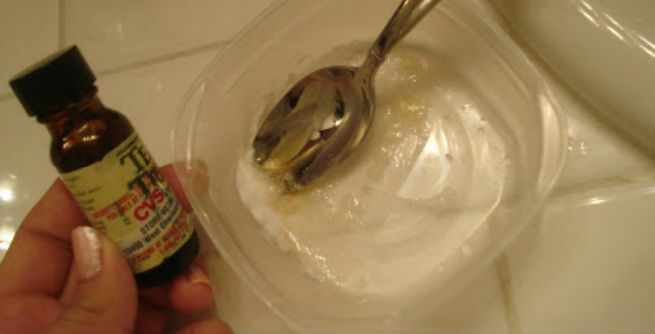 Add 1 teaspoon of jojoba oil and 4 drops of tea tree oil to it. Prepare a smooth paste by mixing all ingredients and apply all over your face. After 15 minutes, wash off with lukewarm water. You will reveal an acne-free toned skin within a few days. Prepare another facial mask by combining 4 drops of pure tea tree oil with the white section of an egg. It should be left on the face for 15 to 20 minutes. After that, rinse off with lukewarm water. Using this mask once a week can help you fight against acne successfully. Prepare a homemade acne-fighting facial scrub by blending 8 to 10 drops of tea tree oil with 4 teaspoons of sugar, 1 tablespoon of raw honey and 2 tablespoons of olive oil. Massage your face with it at least for 4 to 5 minutes. Then, rinse off. It will help you get a clear skin and prevent further breakouts. Add 2 to 3 drops of tea tree oil to your regular cleanser to keep breakouts under control. Pour 2 to 6 drops of tea tree oil into your regular moisturizer and use twice daily to keep skin absolutely free of acne. Adding a few drops of pure tea tree oil to your bathing water can help you stay away from acne on your body.